This volume explores the history of eugenics in four Dominions of the British Empire: New Zealand, Australia, Canada, and South Africa. These self-governing colonies reshaped ideas absorbed from the metropole in accord with local conditions and ideals. Compared to Britain (and the US, Germany, and Scandinavia), their orientation was generally less hereditarian and more populist and agrarian. It also reflected the view that these young and enterprising societies could potentially show Britain the way — if they were protected from internal and external threat. This volume contributes to the increasingly comparative and international literature on the history of eugenics and to several ongoing historiographic debates, especially around issues of race. As white-settler societies, questions related to racial mixing and purity were inescapable, and a notable contribution of this volume is its attention to Indigenous populations, both as targets and on occasion agents of eugenic ideology. In this first general history of PKU, a historian and a pediatrician explore how a rare genetic disease became the object of an unprecedented system for routine testing. The PKU Paradox is informed by interviews with scientists, clinicians, policymakers, and individuals who live with the disease. The questions it raises touch on ongoing controversies about newborn screening and the fate of blood samples collected at birth. Paul and Brosco are to be congratulated on producing an extremely worthwhile, interesting and very readable book. I highly recommend it to geneticists, bioethicists, to those directly or indirectly involved in newborn screening, and to all others who wish to understand the basis for the current enthusiasm about the role of genetics and genetic screening in health and the prevention of disease. A highly compelling story about a successful medical intervention—literally life changing—that has also had unintended consequences. This study is extremely relevant to contemporary genomic medicine. The Paradox of PKU illustrates how much we can learn about the intersections between medicine and society through sustained focus on a single disease... will be essential reading for anyone interested in the sociocultural, ethical and historical aspects of PKU and newborn screening more generally. A fascinating biography of this syndrome ... enriched by illustrations from public health campaigns, advertising material ... and interviews with people who have lived with PKU and who have given first-hand accounts of their lived experience. Paul and Brosco are to be commended for reminding us all how central the PKU story has been to the development of genetics and medicine, the connection of genotype to phenotype to society, and to the way this society views people with intellectual disabilities. This is a book that should be read by all geneticists and physicians and people with an interest and concern about individuals born with intellectual impairments. The PKU Paradox is a clearly and engagingly written book that provides an excellent introduction to the history of a disease and its broader implications in twentieth-century biomedicine. For anyone interested in biochemical genetics and inborn errors of metabolism, The PKU Paradox is a "must" read." The PKU Paradox ... serves as an excellent example of the constructive possibilities inherent in a collaboration between historians and physicians, and indeed, of the value of such an approach. ... a precious exemplar for history-of-medicine students and others looking to develop the skill of writing clearly and succinctly whilst making timely use of extensive and well-placed references in support of sound argumentation. The PKU Paradox is an illuminating book, for it provides a compelling argument against the simplistic and persistent view that genetic diseases are fixed in the lab. Instead, it proposes a complex contextual history, not only a more persuasive one, but also one that provides a model for comprehensive study of other diseases, genetic or not. This second of two volumes published by Cambridge University Press in honor of Richard Lewontin begins with an essay by Lewontin on Natural History and Formalism in Evolutionary Genetics. Chapter 2 is an extended interview with Lewontin, covering the history of evolutionary genetics as seen from his perspective and as exemplified by his career. The remaining chapters cover issues ranging from the history and conceptual foundations of evolutionary biology and genetics, to the implications of human genetic diversity, to the political economy of agriculture and public health. 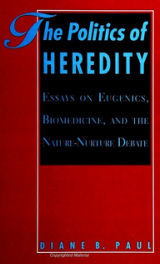 This book explores the development of hybrid corn, the history of eugenics, human genetics, the nature-nurture debate, the origins of the Marxian concept of proletarian science, the shift in the meaning of "fitness" in evolutionary theory, the practice of normal science in Nazi Germany, and the making and selling of science textbooks. While the topics are diverse, a common theme unites them -- each explores links between biological science, social power, and public policy. In the late nineteenth and the early twentieth century, it was widely assumed that society ought to foster the breeding of those who possessed favorable traits and discourage the breeding of those who did not. Controlled human breeding, or "eugenics" seemed only good common sense. How did eugenics come to exert such powerful and broad appeal? What events shaped its direction? Whose interests did it finally serve? Has it survived in other guises? These are some of the questions that Diane Paul sets out to answer. In the nineteenth century, one central topic studied under the rubric of political economy was that of the relationship of wealth to power. In the twentieth century, the territory formerly occupied by political economy was divided between the disciplines of economics and political science. Economists have studied wealth, political scientists power, but the relationship between them has been nobody's professional academic concern. One conspicuous casualty of this decline has been the subject of tax policy. The focus of this book is on the structure of property taxation in big cities, who it favors and why. Its findings are also relevant to the debate over how best to study community power.